Like most of you, I've been eagerly awaiting the release of Stephanie Perkins' sophomore novel for months and months now. My copy arrived on my doorstep Friday afternoon and I carried it around in my purse the rest of the day, just in case I had a chance to start it. Sadly, I did not. But that only meant I got to curl up that night with it and read it straight through from cover to cover in one sitting. In all honesty, that wasn't actually my original intention, as sleep and I have not been as one lately as I would like us to be, and I was really hoping for some Zs. But. It was not to be. I couldn't sleep. And Lola was so madcap and charming. Put the two together and there really wasn't any way I was putting it down at all. So I toddled off to bed somewhere around 4 AM, exhausted but grinning ear to ear. I love this cover, too. Much more than the cover of Anna and the French Kiss. I liked the title on the park bench and the Eiffel Tower and all, but neither person on that one looked anything like Anna or Étienne to me. On the other hand, this is very much how I picture Lola. On a low key day, of course. And curvier, naturally. And while the dude isn't quite eccentric enough to be Cricket, he's certainly not too shabby to look at. I do love, though, how both covers have been set, if you will, in pivotal places in their stories. Don't think for a minute I don't notice (and appreciate it) when you get things right, Cover Gods. Because I do. Lola Nolan asks for very little in life. Just the freedom to dress up in a different costume (complete with wig, false eyelashes, matching nails, and combat boots) every day of the week. The freedom to date her significantly older rocker boyfriend without mountains of judgement raining down on her head from her disapproving parents. And the freedom to never, ever have to see the Bell twins again. Unfortunately, the stars are not aligning in Lola's favor. She can't figure out how to fabricate a key element of her fabulous Marie Antoinette costume she's been planning to wear to the winter formal forever. Her dads appear to be on a set course to disapprove of her boyfriend Max for the foreseeable future. And the Bell family has just moved back in next door, thereby completing the Trifecta of Terror in Lolaland. And to add insult to injury, Cricket Bell (the male half of the Bell twins) appears to remember everything--every last horridly embarrassing detail from the last time they saw each other several years ago now. Not only that, but he seems bent on addressing their history, if you will, in wholly unforeseen and unwelcome ways. Then there's his ever-caustic sister Calliope, with her perfect life and her perfect disdain for all things Lola. And before long, it's like Lola can't do anything right. No matter how hard she tries, everything is falling apart at the seams she's worked so hard to stitch tight. "I called your name." He tries to stop smiling, but his mouth only opens wider with delight. I can practically count his teeth. "I called it a dozen times, but your music was too loud, so I was waiting it out. You're a good dancer." "I'm sorry." His grin hasn't disappeared, but he visibly squirms. "I only wanted to say hello." He swings his legs back inside of his bedroom in one fluid motion. There's a lightness to the way he lands on his feet, a certain grace, that's instantly recognizable. It washes me in a familiar aching shame. And then he stretches, and I'm stunned anew. "Cricket, you're . . . tall." Cricket Bell was always taller than most boys, but in the last two years, he's added half a foot. At least. His slender body--once skinny and awkward, despite his graceful movements--has also changed. He's filled out, though just slightly. The edge has been removed. But pointing out that someone is tall is like pointing out the weather when it's raining. Both obvious and irritating. "It's the hair," he says with a straight face. "Gravity has always been my nemesis." And his dark hair is tall. It's floppy, but . . . inverted floppy. I'm not sure how it's possible without serious quantities of mousse or gel, but even when he was a kid, Cricket's hair stood straight up. It gives him the air of a mad scientist, which actually isn't that far off. His hair is one of the things I always liked about him. Until I didn't like him at all, that is. She knows how to introduce a character, doesn't she? And this particular one is an absolute highlight of the book. Cricket Bell stole my heart and tucked it away in his pocket along with a few mechanical bits and bobs and a candy wrapper or two. Again with the nice guys! It's like Stephanie Perkins is their champion or something. But Cricket is something special. Unfathomably tall, always in motion, he jerks his way through the novel with utterly disarming charm. From his pinstripe pants to his indefatigable hair, the boy tugged at my heartstrings every time he opened his mouth. Which brings us to my favorite thing about Stephanie Perkins' brand of romance. I am most riveted, most in love, when these two are simply talking to each other. It's those quiet scenes where their hearts are laid bare and there's nothing but words between them, and inside each of those words is an entire world, that kill me. My heart squeezes just thinking about it now. Happily, there are also a couple little scenes between Anna and St. Clair as well. They are secondary characters in this one, but let's face it--St. Clair has a hard time being secondary to anything. I delighted in the scenes they shared with Lola and Cricket. Every one of them made me want to re-read Anna and the French Kiss immediately upon finishing this one. While San Francisco didn't manage to have the wonderful ambiance of Paris, and while I may have questioned Lola a bit for persisting in a couple of her emotional missteps for quite as long as she did, she, like Anna, felt real to me. And she felt well-meaning. As though she knew she was making mistakes right and left but was helpless to stop them somehow. Haven't we all felt that way before? Especially when in the death grip of our insecurities. And there's nothing to do but try to mend things the best we can once we do get a hold of ourselves. Such is the case here. I loved how bold and colorful Lola is. And I loved how reticent Cricket is, all the while wearing his enormous heart on his sleeve. I tell you it's a sort of exquisite agony watching Lola and Cricket sit in their windows and do battle with what lies between them. Oh, the longing. It is so very good. Lola and the Boy Next Door is due out on Thursday! oh, this only makes me want to read it more! i can hardly wait to get my hand on my copy thursday. Now I'm even more excited to read the book. And I'm sure that I will have a little stupid looking smile on my face the whole time while reading. i don't know how you do it! how you can make me so desperately excited for a book that I never planned or wanted to read. I simply must buy myself a copy. Inspiring as usual. thank you lovely! Thanks for the Linkage at the bottom!! I'm excited for this one. 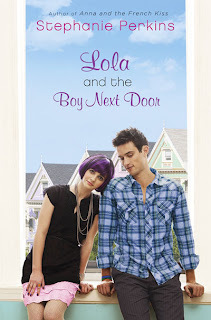 First, I'm a sucker for boy next door stories, and second I loved Anna and the French Kiss. It feels as though I have been waiting for this book ever since I closed the cover on Anna and the French Kiss. Can not wait to read this one! Coming out Thursday? Now I have an excuse to be antisocial and not do homework. I can take a hike to B&N instead! Just picked up Anna and the French Kiss (despite my self imposed ban on all new books until I'd read at the pile by my bed) and really looking forward to breaking it open! By the time I finish Lola should be out too! Tina, it does seem to be going over well with most people, doesn't it? Phanee, thanks! Yeah, don't let the covers deter you. They're much fun. Sabrina, lol. Bet you will. Karen, hope it comes soon! Sash and Em, you're welcome! Loved yours as well. Jenny, then you are going to LOVE this one for sure. Marg, doesn't it? I'm so glad it's finally here. Holly, ooh, I envy you getting to read them both back to back like that. Alexa, they're great. Just great. I've seen lukewarm reviews of this one so I'm glad you still think it's a lot of fun! Waiting for my copy to arrive any day now. I'm so glad you loved this since I did too. She does know how to introduce a character, making them so distinct right off the bat. I cannot wait for ISLA. Oh man. So waiting for this book. New follower. Your review makes me want this book more now. Come visit me over at Livre De Amour-Books of Love Blog. Holly, I can't either. After these two, I'll read whatever she writes. Grace, thanks for dropping in! Will stop by for sure.